The patient, a 28 yrs old female resident of Bihar came to Sassoon General Hospital’s General Surgery OPD for recurrent abdominal pain. 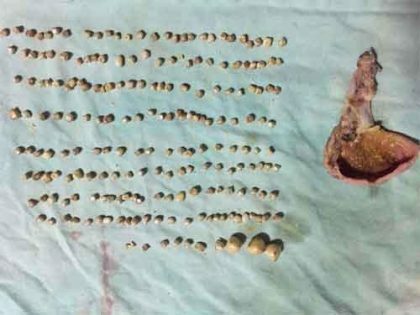 After going through relevant investigation USG-Abdomen she was diagnosed with Gall Bladder stone.She was admitted under Dr. Vandana Dube, Professor, it was decided to perform laparoscopic surgery for the gall bladder removal. Laparoscopy Surgery are being performed in very few Govt. Hospitals in the state and Sassoon General Hospital is one of them. Such a surgery can cost upto 1 lac. Rs. in private hospitals. Laparoscopy surgery has advantanges of having minimal complication, less blood loss, early recovery and minimal post operative pain and the patients can be discharge next day after surgery.